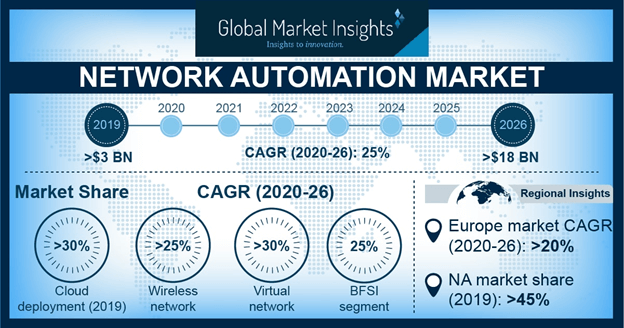 Network Automation Market size was estimated at over USD 1.7 billion in 2017, growing at a CAGR of more than 22% from 2018 to 2024. The network automation market is driven by the advancements in recent technologies of machine learning, artificial intelligence (AI), robotics, and internet of things (IoT). Adoption of such technologies has paved the way for manufacturers to automate their business processes by improving their efficiency, productivity, and speed of the existing enterprise networks. Further, the adoption of automation technologies enables enterprises to enhance troubleshooting of the network issues through real-time data monitoring. The adoption of automation solutions can considerably reduce hardware investment, enabling improved productivity of enterprise networking functions. Also, increasing number of start-ups offering innovative solutions will contribute to the robust growth of the network automation market over the forecast period. Moreover, the increase in investments by venture capital companies and large enterprises in technology will drive the network automation market between 2018 and 2024. The rapid adoption of the technology will benefit major industry verticals, such as manufacturing, BFSI, retail, telecom & IT, and healthcare, for improving their operational efficiency as well as service delivery. However, the surge in the availability of open source automation tools is anticipated to hamper the network automation market. The WAN segment accounted for more than 32% share of the network automation market in 2017. WAN allows large as well as medium scale enterprises to efficiently connect with their global operational centers. The technology allows the companies to centralize their network infrastructure that helps them to optimize internal as well as external communications. The cloud network segment is projected to register a CAGR of more than 31% during the forecast period due to the surge in the adoption of cloud-based services by the SMEs. Due to the benefits of scalability and flexibility offered by cloud-based services, SMEs can reduce their CAPEX and OPEX and invest resources on enhancing their technological capabilities. Regular updates from the server enables the cloud service providers to secure their IT environment without any lag in the network. Such updates from the server offers greater stability to the network by reducing the implementation time and storage costs. The SD-WAN was the leading software segment with a share of more than 67% in the network automation market in 2017. This demand is attributed to the surge in demand of SDN technologies for wide range connectivity. Further, the deployment of SD-WAN enables enterprises to reduce complexities by eliminating hundreds of small tenant’s address spaces into a single physical network infrastructure. Intent-based networking segment in network automation market is expected to register a CAGR of more than 29% between 2018 and 2024. Intent-based networking is an extensive form of SDN that allows the network administrators to define a desired set of automated networks in the organization that reduces the effort of manual programming in the network. The physical network segment is anticipated to lead the network automation market during the forecast period with more than 65% by 2024 due to the large-scale investments on legacy hardware network infrastructure by enterprises and their reluctance to readily migrate to virtual network models. Virtual network segment is projected to register a CAGR of more than 29% during the forecast timeline. The surge in adoption of cloud–based services by SMEs is anticipated to foster the network automation market size of virtual network configuration during the forecast period. Virtual network configuration provides the same network capabilities as that of physical network but reduces the deployment cost of physical network devices. The on-premise segment dominated the network automation market in 2017 with an industry share of more than 72%. Most of the companies prefer to deploy their network configuration within the organization due to the increasing incidents of data thefts and security issues. On-premise ERP allows enterprises to customize the software with greater ability and flexibility. In-house implementation of software reduces the security risk of data thefts, especially in niche industries such as specialized manufacturers. The cloud segment is expected to register a CAGR of more than 26% in the network automation market between 2018 and 2024. The growth in this segment is attributed to the surge in the adoption of cloud-based services by enterprises to benefit from the associated flexibility of deployment and scalable architecture. The quick deployment of cloud-based services leads to an increase in productivity and accelerates the deployment of resources. Low implementation cost and the ability to access the software from anywhere are the key advantages of cloud-based deployment over on-premise deployment. The Telecom & IT segment held the majority share of 29% in the network automation market in 2017. The emergence of 5G infrastructure is expected to offer advanced autonomous driving capabilities, automation, and smart connected devices, strengthening the automation market. Telecom providers are investing heavily on 5G technology to offer the best network connectivity to their end-users. The manufacturing segment is anticipated to witness the highest growth with a CAGR of more than 28% during the forecast period. The advancement in technologies of industrial internet of things (IIoT) and artificial intelligence will help the manufacturers to automate their production process to meet end-user requirements. Further, the emergence of deep learning algorithms, such as cutting-edge technology, will boost the network automation market size in the manufacturing sector. North America accounted for the highest market share of more than 50% in the network automation market in 2017 due to the presence of large key vendors and startups in the region. Further, the adoption of recent technologies, such as intent- based networking, SD-WAN, and DevOps, in the region will strengthen the market growth over the forecast period. The evolution of Industry 4.0 will also boost the deployment of automation technologies into manufacturing sector. Asia-Pacific is anticipated to witness the highest network automation market growth with a CAGR of more than 28% during the forecast period. The increase in 5G investments in China, Japan, and India by the key players and the surge in disposable income of the population in developing countries will contribute to the automation market demand. Increasing need for improved productivity and operational excellence is expected to have a positive impact on the market. The adoption of networking technology also enables the enterprises to maintain six sigma standards into their production processes. The adoption of six sigma methodology assists the enterprises to reduce the cycle-time of the product. The principles of six sigma help the manufacturers to produce quality products and increase the efficiency by around 30%. 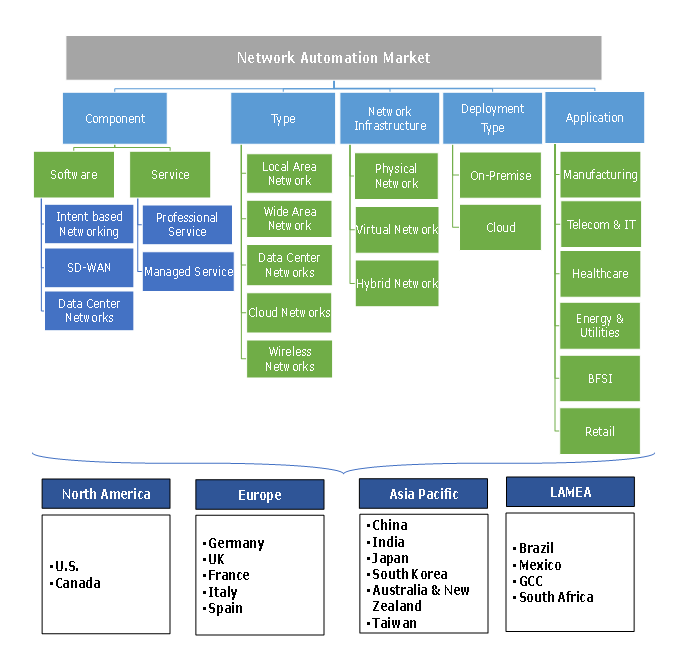 The network automation market is highly fragmented due to the presence of a large number of key players in the market. The top companies in the market accounted for approximately 60% of total market revenue in 2017. The key players of the market invest in startups to strengthen their market presence. Some of the key players operating in the network automation market are Cisco, Juniper Networks, IBM, Micro Focus International, NetBrain, SolarWinds Worldwide, Riverbed, BMC, Apstra, BlueCat, Entuity, Veriflow, 6Connect, Anuta, Puppet, Gluware, HelpSystems, Wavestone, IPsoft, Fujitsu, Red Hat, Intraway, Arista, Network to Code, Infloblox, Cumulus Networks, Onapsis, EfficientIP, Itential, and HCL. The startups in the network automation market focus on partnerships and collaborations with major players to boost their market share. For instance, in May 2018, Apstra partnered with Awnix, an IT service provider of cloud services in the U.S. to integrate AOS-supported OpenSwitch (OPX) on Dell Z9100 switches. On the other hand, major players opt for mergers & acquisitions and R&D investments as their major strategy to strengthen the network automation market revenue. For instance, in June 2018, Cisco Systems, Inc. invested USD 60 million in Avi Networks to offer multi–function network capabilities to its users. Network automation is a rapidly evolving technology that allows the network service providers to offer enhanced productivity and scalability to the end-users. The adoption of the solution helps the enterprises in increasing the network uptime by nearly 40%. Automating network operations allows enterprises to reduce their resource consumption on network management workflows while enabling increased accuracy and efficiency of networking functions. The agility in network configuration and meeting the demand for Service-Level Agreements (SLAs) will help the enterprises in meeting user requirements by offering customized solutions. The adoption of technology enables the enterprises to centralize their network configuration, allowing organizations to perform real-time network error management.